Seeking to wow people with creative flavor combinations and locally sourced, seasonal ingredients, Pastry chef Jocelyn Gragg knows a thing or two about making life sweet. Jocelyn Gragg is no stranger to the kitchen. 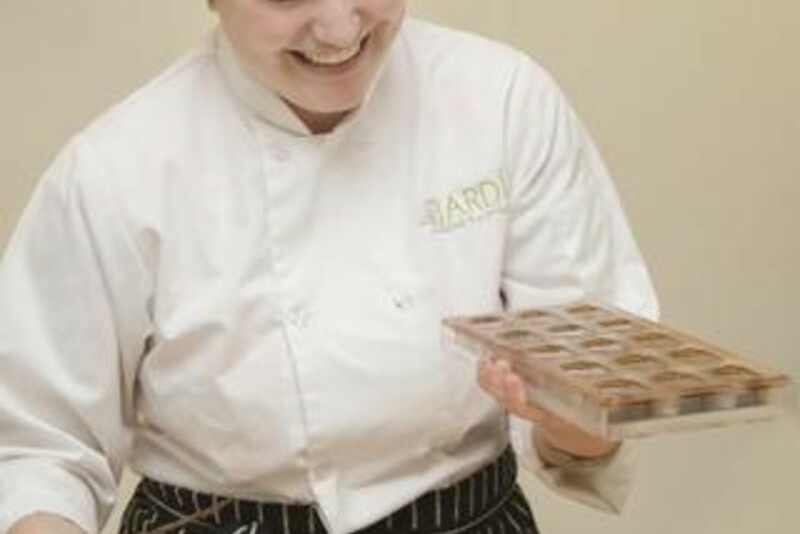 Graduating from the CIA's Hyde Park campus and spending her formative professional years as a pastry chef in some of the best fine dining restaurants in the South, she found inspiration in using the fresh, local ingredients available to create interesting, tasty flavors in her desserts. After an internship in a chocolate shop, Jocelyn decided to open up her own in Atlanta. 1) What brought you into the world of chocolate? What makes working with chocolate so rewarding? The world of chocolate kind of grabbed me – it was one of my favorite classes in college (I have a bachelors in Baking & Pastry Arts from the CIA, and each 3 weeks is fully immersive in that particular type of cuisine or cooking: 3 weeks in breads, 3 weeks in wedding cake design, 3 weeks in tarts and pies, 3 weeks in mousses … you get the picture haha. You do nothing but eat sleep and breathe that one topic for 14 days. So when I was the pastry chef in restaurants like The Georgian Room or Restaurant Eugene, doing small treats for their mignardises programs was part of my job description and I started messing around with chocolates but really quicly realized how hard it is to do it when you don’t have control over your environment – it’s too hot, it’s too small, it’s too humid – and once I got tired of working in restaurants, I sat down and thought about what aspects I enjoyed most it was chocolate. 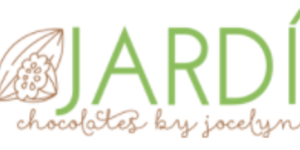 So we decided to start our own company and after MANY iterations (at one point it was a café/bakery concept, haha) we landed on what JARDI is now; online retail and wholesale, selling to people who want high-end chocolates but don’t necessarily have the ability to do it in house after encountering the same issues I was. Chocolate is so rewarding ‘cause it’s so difficult. You have to really understand chocolate to make it do what you want – it kind of has a mind of it’s own – and there’s a lot of set in stone rules. 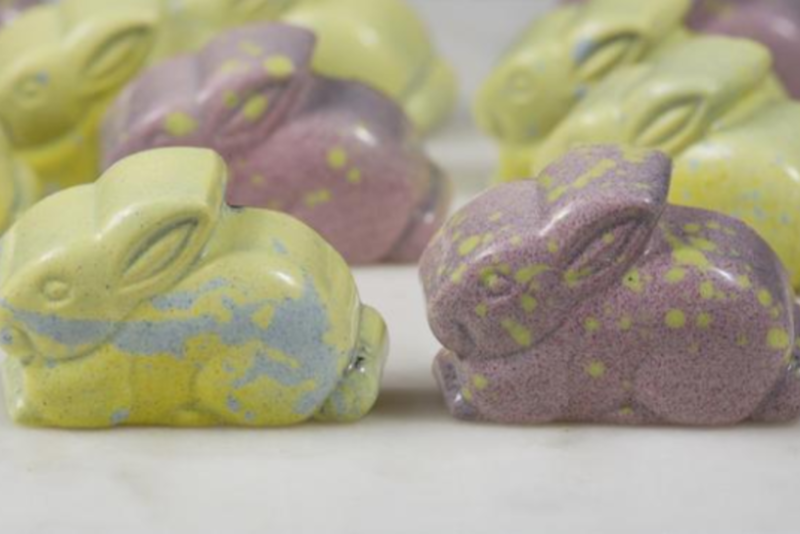 What’s fun is knowing it to a point of being able to break some of the rules and really expand what’s traditionally been done in chocolate work – especially in the flavors we use. I want to push the boundaries a tiny bit on what people consider “chocolate flavors” like using more savory ingredients like tahini or kafir lime. 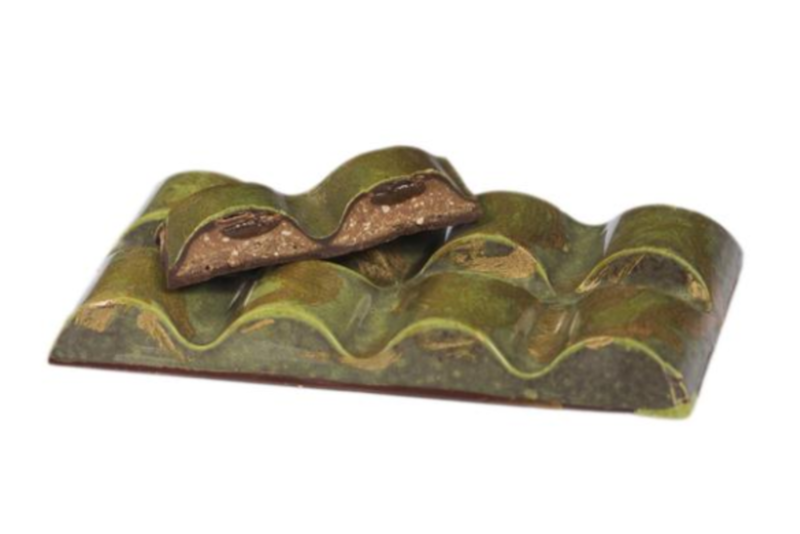 2) What inspires your chocolate creations? Do you experiment a lot or stick with the tried-and-true? Things I see being done in restaurants that I admire, flavor combinations that I taste or see, ingredients I see in the store, a tasting panel that my husband did in the food and wine fest last year on flower flavors in wine –the brain waves come from really strange places! 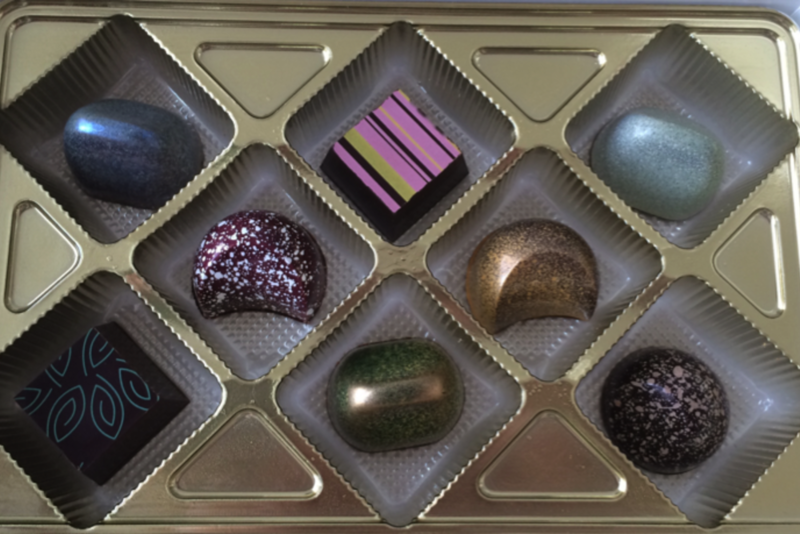 I generally start with one flavor and build on it – all of our chocolates at the end of R&D have anywhere from 3-7 flavoring ingredients to make it really pop. Then I’ll start to add something complimentary and traditional and see if that makes it better, and sometimes I’ll go the opposite route and find something that is its polar opposite that just happens to be delicious. The main thing is always to season it. One of my favorite mentors used to hate being called a pastry chef instead of just a chef, ‘cause she felt that there was a stigma around pastry chefs for never seasoning their food properly, and she trained me to have salt on hand always. I’ve expanded that a tiny bit and play around with seasoning food with itself – like our yuzu truffle which we use not just yuzu juice but also finish it with powdered, dehydrated yuzu fruit. We always want the flavors to pop. With our raspberry marshmallow, we also add a bit of freeze dried raspberry powder in the coasting mix, to make sure that the flavors pop. Plus everything also get a healthy hit of salt too. All our fillings are tasted at every step of the process, and the finished products are tasted by me and my husband (and some friends and neighbors if they happen to come by the kitchen at the right time) multiple times. So it’s a little of both – the methods we’re using are just slightly versions of tried and true techniques. 3) Of all the yummy chocolates you've concocted, do you have any favorites? It’s like being a parent – you can’t have a favorite kid haha. I don’t snack on much in the shop, after almost 2 years I’m past craving chocolate! But when I do want to munch on something beyond what I’ve already been tasting as I go I tend to lean towards the more salty fillings, like the Kirstina’s Favorite (which is peanut butter and chocolate covered pretzel pieces) or the Bar #1 – the maple caramel almond butter is amazing by itself and the pairing with the strawberry caramel is just perfect (in my completely biased opinion!). Salty and sweet and it’s just fatty enough to really coat your palate and the flavor sticks with you for a while. 4) Where does the name JARDI come from? JARDI means ‘garden’ in Catalan, the dialect of northeast Spain. When we finally finalized the concept for our company being a chocolate shop, we wanted to find a name that drew a picture in your mind. The concept we had of boxed truffles in our heads was an edible Tiffany’s box – classic, simple, tied with a ribbon and you open it to something so beautiful it takes your breath away … paired with the manicured gardens in Disney world. Colorful and beautiful and completely natural, just slightly altered by humans to make it better but never distract from what nature intended. From there it was easy to go the no preservatives, no food dyes, no artificial flavors route – aside from personally believing it makes food better, it’s also a bit more challenging to not use fake flavors and to really have to work and extract every gram of flavor from something, and it’s easier to explain to people what’s inside. We chose to use Catalan for a two reasons: my husband and I went to Spain on our honeymoon and loved it, and my mom’s family immigrated to the US from Spain in the early 1900s, so it felt like a nice homage to my grandparents and great-grand parents.